Product #46286 | SKU ANR007608ESD | 0.0 (no ratings yet) Thanks for your rating! 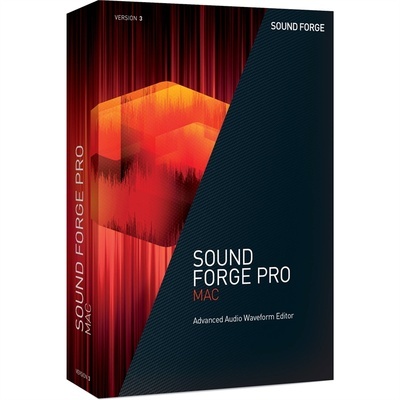 Sound Forge Pro Mac 3 from MAGIX Entertainment is an advanced audio waveform editor optimised for the Mac OS X environment. It provides audio engineers with an extensive suite of restoration, repair, editing, and mastering tools, to record and produce broadcast- and streaming-ready audio master files, for music, dialogue, video, and more. Sound Forge Pro 3 features a flexible interface that can be easily configured to optimise your workflow for the task at hand. The software is equipped with a powerful audio engine which lets you simultaneously record up to 32 channels of high-resolution audio, at 24-bit/192 kHz. Precise control over the editing process is achieved with the ability to edit at the sample waveform level, using the included Spectralayers Pro 4 spectral editor. Distorted audio files can be restored with the iZotope De-Clip plug-in, which detects and repairs clipping artefacts, while the iZotope Voice De-Noise plug-in works to enhance vocals and dialogue clarity by reducing background noise. To help deliver a full and loud final master, Sound Forge Pro 3 comes with mastering plug-ins that include the Wave Hammer compressor/limiter and iZotope Ozone Elements. In addition, the Automatic Loudness Levelling combined with the Loudness metres simplify the process of finalising AES/EBU-compliant, broadcast-ready audio master files, and ensure compliance with broadcast loudness regulations such as the CALM Act.